Reproduction and quotation of the texts are allow­ed if reference is made to the author and source. However, legislation regulates and restricts the right to reproduce the illustrations. Please contact the respective publishing institution for information. Advertising is not accepted. The Swedish National Road and Transport Research Institute (VTI), is an independent and internationally prominent research institute in the transport sector. Its principal task is to conduct research and development related to infrastructure, traffic and transport. The institute holds the quality management systems certificate ISO 9001 and the environmental management systems certificate ISO 14001. Some of its test methods are also certified by Swedac. VTI has about 200 employees and is located in Linköping (head office), Stockholm, Gothenburg, Borlänge and Lund. VTT Technical Research Centre of Finland is a contract research organisation with a staff of 2,800. In this joint publication, the VTT expertise areas cover research and development of transportation, logistics and road structures. The work is carried out in five research groups employing a staff of 60. The IRCA’s mission is to provide the Icelandic society with a road system in accordance with its needs and to provide a service with the aim of smooth and safe traffic on land and on sea. The number of employees is about 300. Applied research and development and to some extent also basic research concerning road construction, maintenance, traffic and safety is performed or directed by the IRCA. Development division is responsible for road research in Iceland. The Norwegian Public Roads Administration is one of the administrative agencies under the Ministry of Transport and Communications in Norway. The NPRA is responsible for the development and management of public roads and road traffic, as well as the Vehicle Department. This responsibility includes research and development of all areas related to road transport and the implementation of R&D results. 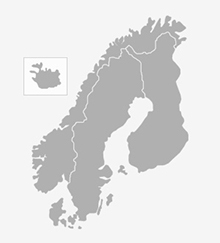 The Institute of Transport Economics is the national institution for transport research and development in Norway. The main objectives of the Institute are to carry out applied research and promote the application and use of results through consultative assistance to public authorities, the transport industry and others. The Institute is an independent research foundation employing about one hundred persons.